One thing I really miss when we started living in a commercial district is the sight of buko vendors peddling their goods along the streets. It’s from them that we usually get our supply of fresh buko juice and buko meat. I love buko juice, and I’m happy to know that there are now stalls in the malls and supermarkets that sell natural and fresh coconut water, such as Coco Fresco. Hubby and I are crazy about Coco Fresco. We love their Coco Water and their Coco Shakes. However, I seldom get to buy Coco Fresco products because they have no stall at Robinsons Galleria. It’s a good thing there’s Tropicana Coco Quench! Last September, I was invited to the launching of Tropicana Coco Quench, but I wasn’t able to attend because I was working. However, this didn’t stop me from trying out this newest offering from Pepsi-Cola Products Philippines. I tried it, and I liked it. 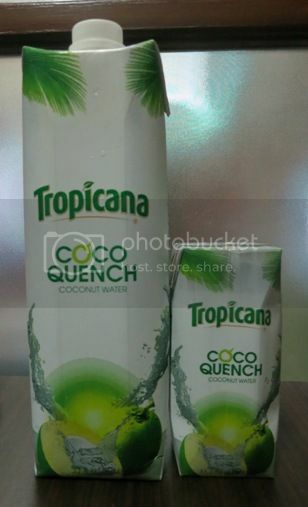 Now, each time I do my grocery shopping, I make sure I have a 1-liter pack of Tropicana Coco Quench. •	It tastes like real coconut water because it’s 100% pure coconut water. •	It has no preservatives and no flavors added. •	It’s refreshing and thirst-quenching. •	It has a convenient packaging that seals in the freshness of coconut water. •	It’s a healthy drink. •	It’s readily available in the supermarket near us. Have you tried Tropicana Coco Quench yet? This entry was posted in Coco Fresco, Coco Water, Coconut Water, Tropicana Coco Quench. Bookmark the permalink. I missed that event and I haven’t tried Tropicana Coco Quench yet.